The Teton Village wastewater treatment plant is a tertiary treatment facility that discharges drinking water quality effluent to a Class I groundwater. The treatment plant is designed to be expanded in phases as the community of Teton Village grows. The resort community has extremely variable flows and therefore the treatment plant is designed for flexible operation at a low flow of 0.1 MGD in the off season and peak flows of 0.9 MGD in the summer and winter season. The primary treatment facilities, consisting of a 3 mm step screen and washer compactor, influent flow measurement, and inline flow equalization, are designed for the peak hour flow on the maximum day, of 1.8 MGD, at build out. The secondary treatment process is an extended aeration activated sludge treatment facility consisting of 4 aeration basins, with coarse bubble aeration for mixing and fine bubble aeration for oxygen transfer, and a circular clarifier with back-up rectangular clarifiers. The blowers for the aeration system have variable speed drives which are controlled by dissolved oxygen (DO) probes and/or oxidation reduction potential (ORP) probes to optimize aeration thus saving electrical power. The power savings is 60% when compared to a conventional on off aeration system. Nitrification occurs in the aeration basins and denitrification occurs in anoxic basins. Mixed liquor from the aeration basin is mixed with the influent raw wastewater in the combined anoxic/flow equalization basin, which allows the bacteria to strip the oxygen from the nitrate molecules leaving nitrogen gas and nitrite. 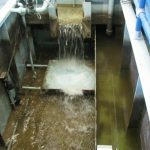 The effluent from the clarifier flows through, multiple parallel rapid, polishing sand filters and then is disinfected with a ultra-violet (UV) system prior to final flow measurement and discharge to one of three shallow groundwater recharge wells. The treatment process consistently produces an effluent with BOD5 and TSS of less than 5 mg/l, ammonia of less than 0.5 mg/l, and nitrates concentration of less than 7 mg/l. 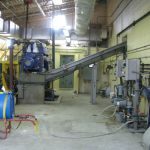 The biosolids management process consists of aerobic digesters, a rotary drum thickener for solids concentration, and a centrifuge for solids drying. The Class B biosolids are trucked to the regional landfill to be used as a soil amendment for landfill reclamation. Because the Teton Village wastewater treatment plant is in close proximity to residential housing the facility also has odor control facilities consisting of an air ionization system. Fresh air passing over ion tubes picks up both positive and negative ions, forming highly oxidizing clusters of oxygen molecules that oxidize odors, without ozone. Odors are eliminated at the source, so clean air can be expelled to the neighborhood.